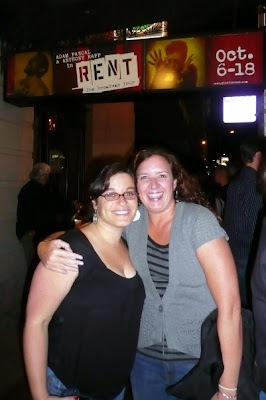 For seven hours this past Friday I waited in line for $20 rush tickets for the musical Rent at San Francisco's Curran Theater. Yes my friends, this is the fun I have on my furlough Fridays. I am one of those crazy music theater lovers who would do such a thing. The Curran Theater has been (I believe today is the last day of the short two week run) graciously saving the first two rows of the orchestra (rows AA and BB) for rush tickets buyers. There were only 26 seats. After those were snatched up they offered up some remaining seats for $30. We got the last $20 seat and the first two $30 seats in one of the boxes. The view was obstructed and we couldn't see anything that occurred in the back of the stage (missed all of Mimi's "Take Me Out") and anything upstage right. HOWEVER, we were close enough to see facial expressions and to feel the full emotional force of these gorgeous songs. I cried when Angel and Collins expressed their love for each other in "I'll Cover You" and again when Angel died. Man, I love this show. Anthony Rapp and Adam Pascal, the originators of the characters Roger and Mark. 13 years later, they sound better than ever. In fact, Adam Pascal's voice was one of my least favorite from the original Broadway recording. His voice has filled out and improved by leaps and bounds since then. I waited in line for 7 hours. My bum is still a soar from sitting on the sidewalk. I even got yelled at by a homeless guy and we had a an Anthony Rapp sighting as he walked to Starbucks across the street. I also met a lovely new friend, Sharon, who is a voice student at San Francisco State University and aspiring music theater performer. We talked shop for most of our waiting time and the day flew by. Here's a picture of her getting her program signed by Adam Pascal. Go girl! 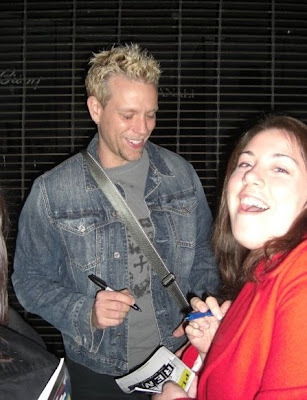 Sharon meeting Adam Pascal, the original "Roger"
More of line, I doubt many of these people got tickets. The line got even longer that afternoon. This was a fantastic performance and it was well worth the wait. I know the original Broadway recording well, so seeing Pascall and Rapp play the parts was a huge treat. Furlough Fridays can be fun! Wow! I feel so special!Thanks for making me a part of your blog! "Anon"- Of course! I was so glad to share the day with you!